This meeting was hosted by Marian Harkin MEP, who opened by saying that many life-threatening diseases have been eradicated thanks to years of effort by physicians, scientists, and medical professionals investigating the causes of and potential treatments for disease. She stressed how crucial it is that the huge challenges posed by brain and pain disorders are addressed through integrated, coordinated and co-operative efforts, both at the European and national level. The first speaker was EFNA Executive Director, Donna Walsh, who said that research was a central focus of the Interest Group. This, she attributed to the huge unmet needs of patients affected by brain, mind and pain disorders. For many of these disorders there is no cure. In fact, in most cases, we are still unaware of the exact cause. More research is needed – from basic to clinical to translational. However, due to the complexity of this research, the high failure rates and the lengthy development times (compared to other disease areas), many companies are downsizing or closing their operations in this area. She called for the EU to ensure that public funding through H2020 and the IMI ensured that they bridged this gap. 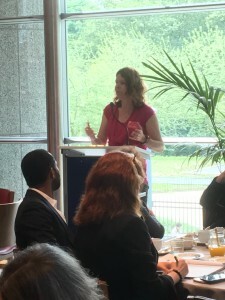 The next speaker – Isabelle Abbey-Vital of Parkinson’s UK – spoke about the UK system of patient and public involvement [PPI] as an example of best practice. However, she said, that while many researchers are open to patient involvement, they are not always sure where to start. This led to the development of Parkinson’s UK ‘Resource for Researchers’ which outlines how and why they should engage in PPI. The next speaker was Prof. Judith Rosmalen of the University of Gronigen. She began by stating that medical research is traditionally focused on diseases, but how we feel is determined by symptoms. Most symptoms remain medically unexplained, and many EU citizens have to live with their symptoms every day. She has worked with her team to develop an eHealth system called Master your Symptoms, which will provide patients with personalized self-help guidance in order to manage their symptoms. In the context of this project, the researchers asked professionals what interventions they considered most useful for patients. They also asked patients what interventions they preferred. It was then discovered that the ideas of the professionals did not meet the patients needs. One aspect which was particularly emphasised from the patients was the need for better communication with health care professionals. Now, with the help of a grant from EIT Health, the researchers are developing an online course to train professionals in communication with patients with medically unexplained symptoms. 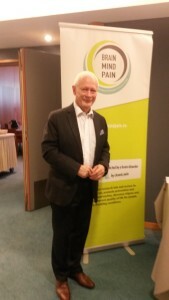 To ensure the patient perspective is heard throughout this project, Pain Alliance Europe will be actively involved. Based on her experiences, Prof. Rosmalen had the following recommendations for implementation at the EU level. Provide funding for topics that are considered relevant by patients. Medicine is not about diseases, it is about patients. Ask in grant proposals for information on how patients were and will be involved in the project. Expand the EU focus on eHealth initiatives, also to somatic symptoms. eHealth programs are able to support patients in their self-management of diseases and enable patients to actively participate in their care. Empower patients and caregivers by increasing their general knowledge about health problems. Massive Open Online Courses (MOOCs) may be a very efficient method to share knowledge with patients and citizens across Europe. The next speaker was Rachel Schindler MD, Vice-President, Neuroscience at Pfizer. She began by stating that there are many opportunities for bilateral exchange of information between patients and drug developers throughout the drug development process. The meeting finished with a fascinating, keynote presentation from Michal Boni MEP on the opportunities for greater patient involvement in research via e- and m-Health applications. “This is – the new opportunity due to new technologies, due to digital game changer – to make the healthcare systems much more preventive, cost effective, patient centric, with high quality results of the therapies due to personalization of treatment. And with the new possibility: to collect more data, to process them in the direction to have more knowledge on specificities of some diseases,” he said. He finished by pleding his support for the MEP Interest Group on Brain, Mind and Pain – saying: We need the leadership – common leadership and shared responsibilities. So, let’s do this – together! You can access the full speech here. You can also read his position paper on mHealth. The meeting finished with a short discussion session with contributions from the floor. These included input from Magda Chlebus of EFPIA who spoke about three upcoming IMI projects which will explore chronic pain, but also – in October – the launch of a project on patient engagement (Why? Who? When?). She encouraged the patient partners of the Interest Group to get involved. 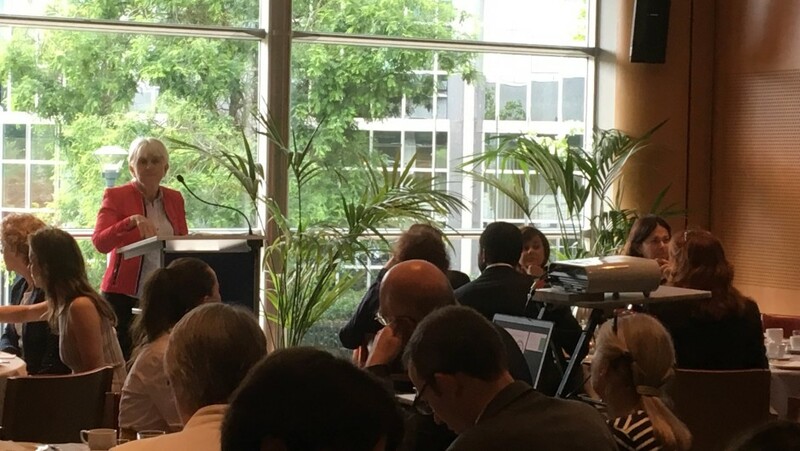 Catherine Berens of DG Research, Neuroscience, also participated on the day and spoke about how the Commission increasingly recognises the central role of patients. She encouraged patient advocates/organisations to contribute to their wide consultations around their proposed work programmes. She also said that there is now more scope for patient participation in Horizon 2020. This includes patient representatives in the Advisory Group but also within individual projects, where their costs to participate are fully covered. Marian Harkin thanked all speakers, participants and organisers and closed the meeting. Note: During the meeting both MEP Harkin and Ann Little, EFNA President, updated participants on the Interest Group’s upcoming Written Declaration on Access to Employment. This will be open for signing from September 12th – with a launch event in Strasbourg on September 13th, hosted by MEP Heinz Becker. All present were encouraged to get involved in asking any MEP contacts, particularly nationally, to sign. The Interest Group will provide promotional materials and templates to equip those willing to support to get involved. Contact: euaffairs@efna.net for any further information. brainmindandpain has not yet written their Bio. Meanwhile we can say that he already contributed with 15 articles.